We have characterized the distribution of 25 trace elements in magnetite (Mg, Al, Si, P, Ca, Sc, Ti, V, Cr, Mn, Co, Ni, Cu, Zn, Ga, Ge, Y, Zr, Nb, Mo, Sn, Hf, Ta, W, and Pb), using laser ablation ICP-MS and electron microprobe, from a variety of magmatic and hydrothermal ore-forming environments and compared them with data from the literature. We propose a new multielement diagram, normalized to bulk continental crust, designed to emphasize the partitioning behavior of trace elements between magnetite, the melt/fluid, and co-crystallizing phases. The normalized pattern of magnetite reflects the composition of the melt/fluid, which in both magmatic and hydrothermal systems varies with temperature. Thus, it is possible to distinguish magnetite formed at different degrees of crystal fractionation in both silicate and sulfide melts. The crystallization of ilmenite or sulfide before magnetite is recorded as a marked depletion in Ti or Cu, respectively. The chemical signature of hydrothermal magnetite is distinct being depleted in elements that are relatively immobile during alteration and commonly enriched in elements that are highly incompatible into magnetite (e.g., Si and Ca). Magnetite formed from low-temperature fluids has the lowest overall abundance of trace elements due to their lower solubility. Chemical zonation of magnetite is rare but occurs in some hydrothermal deposits where laser mapping reveals oscillatory zoning, which records the changing conditions and composition of the fluid during magnetite growth. This new way of plotting all 25 trace elements on 1 diagram, normalized to bulk continental crust and elements in order of compatibility into magnetite, provides a tool to help understand the processes that control partitioning of a full suit of trace elements in magnetite and aid discrimination of magnetite formed in different environments. It has applications in both petrogenetic and provenance studies, such as in the exploration of ore deposits and in sedimentology. The online version of this article (doi: 10.1007/s00126-014-0529-0) contains supplementary material, which is available to authorized users. This project was funded by NSERC, DIVEX, Vale, and the Canadian Research Chair in Magmatic Metallogeny. We thank S. Medhi, D. Savard, and M. Choquette for their assistance with laser ablation-ICP-MS and microprobe analyses and F. Tornos for andesite samples from Chile. Comments by E. Sawyer and D. Gaboury helped improve the paper at an early stage. We thank the Editors (A. Barth and R. Cox) and reviewers of Geology (K. Goodenough, J. Mauk, and 1 anonymous) for their useful comments which helped improve an early version of this manuscript. 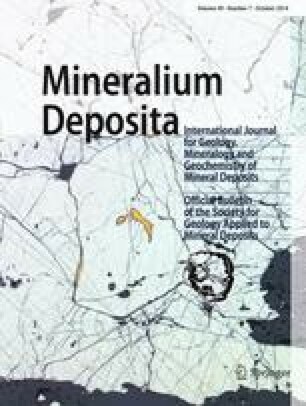 Thanks are also given to P. Nadoll and B. Lehmann for their reviews and editorial handling of this manuscript in Mineralium Deposita.